Our B&B in Monterotondo won our hearts — space heaters in the rooms to get rid of the chill, warm showers and a rooftop breakfast room with views of the red tile roofs and TV antennas of this classic, Italian hill town. After breakfast we headed down and out of town, following road names that remember saints like Santa Chiara and Catholic orders like Brothers Minor — just one more way Italy celebrates its Catholic heritage. 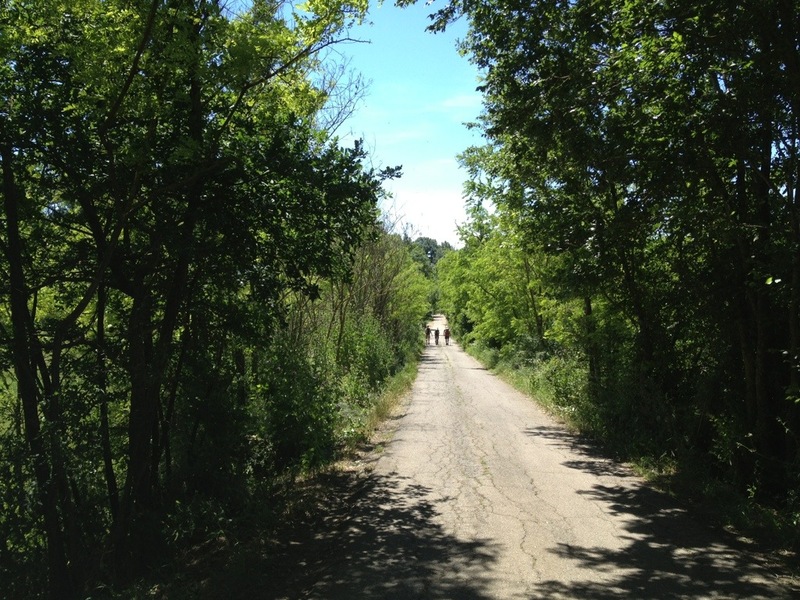 The biggest part of our walk today was through a vast wildlife refuge on the outskirts of Monte Sacro. To get there, though, we had to successfully navigate two unusually difficult obstacles. First, we arrived at the bottom of a hill where our gravel road took a hard right turn apparently through a series of farms. Oddly, the waymark sign pointed left instead of right. Andreas grabbed the sign and turned it on its mount so that the arrow on its back side pointed right. Then, believing we’d done future generations of pilgrims a big favor, we began walking that way. We then heard shouts from a man working in a field 50 meters away, “Go the other way,” he shouted, pointing to a field of tall grass with no apparent trail. We puzzled about our odd choice, then changed the sign back and plunged into the virgin field, finding a dim track of hardened earth beneath our feet. This invisible track carried us around the man’s farm and precisely to the correct location suggested on our map. Who knows where the “obvious” path would have taken us, but we were thankful for the man who encouraged us to follow the sign that seemingly led nowhere. The second obstacle presented itself about 3km later. We followed a paved road that we were certain was our correct path until it ended in a “T” at a gravel road atop a hill. Momentarily we were distracted by what was obviously a distant view of Rome, crowned by Michelangelo’s dome at St. Peter’s. When we went to find our route, though, we realized that the gravel road ended both to the left and right at gates sternly marked “Private Property.” We stood befuddled for about 5 minutes, debating what to do, when a man smoking a cigar drove up in a black Mercedes and explained that our path was around the private gate at the right. While he unlocked the gate and drove through we ducked around the narrow opening on the right. Before long we were clearly back on track, but who would’ve guessed that a major pilgrim path would require a person to disregard a private property sign? After these obstacles we settled into a walker’s paradise — a gravel road through car-free wildlife refuge with crisp sunshine and mild temps. The reserve includes vast fields of red poppies, tall evergreen trees, and the soft sounds of the occasional burbling brook. 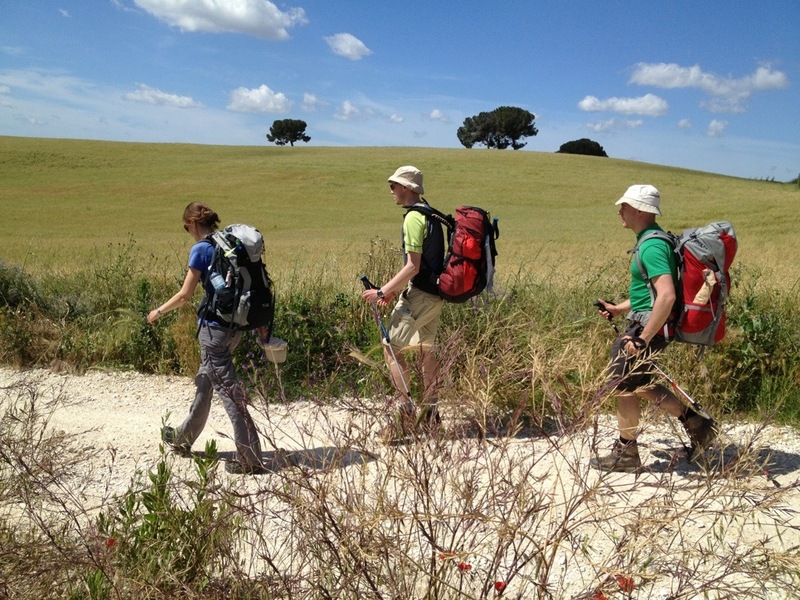 These were among the most pleasant miles I’ve ever walked on any camino. 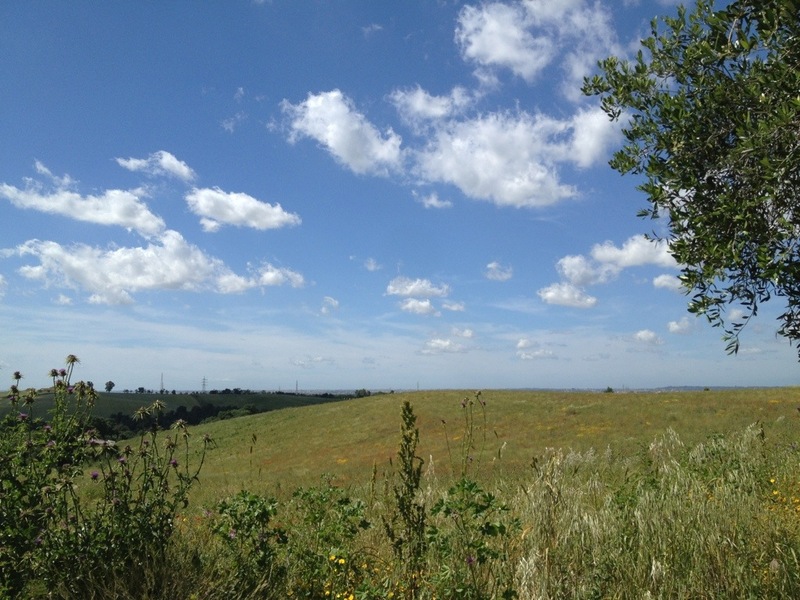 All good things must end, and the wildlife area turned after several kilometers into the exurbs of Monte Sacro, which in reality are the ex- exurbs of Rome. Our gravel path became an asphalt road, and soon we were hopping on and off sidewalks at pedestrian crossings between zipping cars and motorcycles. The noise reminded us of how long we’ve been away from city life and how odd it feels to someone who hasn’t relied, if even just for two weeks, on the 2- and 4-wheeled conveyances that help us do our work and play and that unsettle and complicate our lives in so many ways. 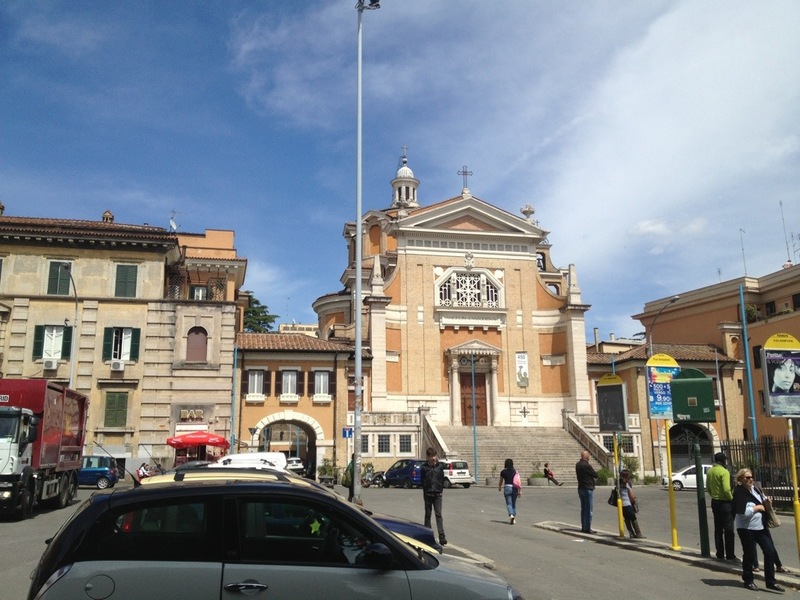 After a quick gelato at a strip mall cafe we trudged through the noisy streets toward the end of today’s stage, the Church of the Angelli Custodi. Just a few blocks before our goal we nearly walked right past a B&B which we would ultimately choose as our lodging for the evening. With a laundromat across the street and a pizza/rotisserie takeout a few blocks away we were set for a relaxing evening — our last night outside of Rome.